I knew it was going to be an expensive month already at the beginning of the month when I ordered a new underwater camera and a new kindle on amazon. Unfortunately our underwater camera has give up, been too deep (over 10 m) too often I'm afraid. The new one is good to 15 meters, so hopefully that should be fine, if not is supposed to warm me I'm going too deep. Phil killed my kindle when he put a knee onto the screen, ups. It's very hard to be without a kindle, we LOVE them. 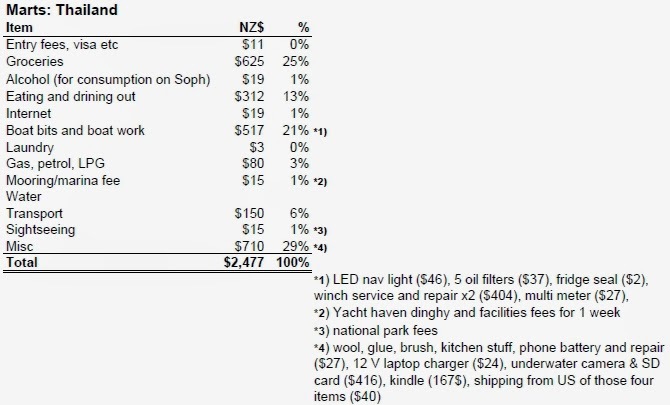 All up we spent NZ$ 2477 for the month of March, definitely one of the more expensive months. Two big shopping trips (with car hire) didn't really help either, although we did get some yummy things we have been missing, e,g. falaffel mix, lollies and sour cream to name a few. We spent a lot on boat bits as well, specifically $404 on winch service and repair. It took them two goes to get it fixed, and over two weeks, not very impressive, but at least the winch is finally working now and we're happy to be able to move around again.